“You could start a fire with the heat between you two." “Have you kissed many boys before?" he asked quietly. His question brought my mind back into focus. I raised an eyebrow. "Boys? That's an assumption." Noah laughed, the sound low and husky. "Girls, then?" "Not many girls? Or not many boys?" "Neither," I said. Let him make of that what he would. "I am taking away that word. You are no longer allowed to use it. How many?" My cheeks flushed, but my voice was steady as I answered. "One." At this, Noah leaned in impossibly closer, the slender muscles in his forearm flexing as he bent his elbow to bring himself nearer to me, almost touching. I was heady with the proximity of him and grew legitimately concerned that my heart might explode. Maybe Noah wasn't asking. Maybe I didn't mind. I closed my eyes and felt Noah's five o' clock graze my jaw, and the faintest whisper of his lips at my ear. Check out the trailer guys!!! It's one of the best book trailers I've ever seen!!! There isn't anything I could say about this book, that hasn't already been said. You'd have to be some sort of seclude, living in an underground nuclear bunker, to not have heard about Unbecoming of Mara Dyer before. This book had been hyped up like CRAZY. It had been on everyone's lips! People were totally in love with it even before the ARCs were printed! It's one of the hottest releases of 2011, definitely one of my top 5 favorites. And Noah.. Noah Shaw.. *wipes drool from chin* - don't even get me started! Before I start my Noah-inspired raving fit, though, I'd like to talk about the plot a bit. Mara Dyer wakes up in a hospital with a couple of bruises and no recollection of how she got there. Something terrible happened during her late-night exploration of an abandoned building. She wasn't alone when the accident took place, though, she was there with a group of her best friends. And now all her friends are dead and she can't remember what it was that caused the building to collapse and bury them all under tons of debris. Like that wasn't enough, weird things are starting to happen around her. She starts getting those flash-back dreams in which - piece by piece - she slowly uncovers the mystery behind the freak accident. The more she learns, the more terrified she becomes, cause maybe.. just maybe.. the building collapse wasn't accidental after all. That's about as much as I can tell you without giving away too much. I absolutely loved the construction of this novel - the way Mara didn't know what happened to her and we got to discover the truth along with her, step by step - it was brilliant! It made the whole thing way more mysterious and exciting. It's definitely a blood-pressure riser, I had those moments when it felt like I couldn't flip the pages fast enough! It's a pretty big novel - I mean 452 pages is not too much, but it's not exactly what you'd call a short read, right? Well, guess what?! I breezed through those 452 pages (what felt like) on a single breath! Despite the paranormal aspect of this book (which, btw, was very subtle and not overwhelming at all), this novel felt very real. I liked how it focused more on what Mara felt and what she had to go through, while discovering the shattering truth about herself and what she's capable of, rather than blowing the whole paranormal thing way out of proportion. I got to know Mara and Noah, I learned a lot about them and, thanks to Michelle Hodkin's fantastic storytelling, I could feel their emotions. And there was A LOT to feel. It's a deliciously intense book, dripping with all sorts of emotions: fear, uncertainty, anxiety, anger, regret, desire, love, curiosity, hope.. It's all there! This is a terrific read - the plot is tightly woven and well-thought out. It makes you think, makes feel, makes you sweat, leaves you slightly light-headed and wanting more - everything a great book should. And Noah? Oh, Noah!!! I could eat him alive - he's such a hottie! British, mysterious, total sweetheart with a reputation of a heart-breaker.. ahhhh~ So swoon worthy! It's officially my number one on the Book Bachelor list (bye bye Jace!). Undoubtedly one of the best male protagonists EVER. And not only because he is drop-dead gorgeous and bring-me-a-napkin drool-inducing hottie, but also because of his wonderful character, wittiness, mysteriousness, gentleness... everything! There is no other like Noah Shaw!!! I can't emphasize enough how AWESOME this book is. It's one of the 2011 YA releases that you absolutely have to read. No discussions. Go get yourself a copy, you'll thank me later! When I read this, I was incredibly happy that I liked it as much as I expected after all the crazy hype surrounding it. And Noah... aah, I seriously couldn't get enough of him. I think we both have the hots for him huhuuhuhu!!! btw, I had no idea you were Canadian and I just notive you are from Vancouver! lucky!! Cinda Chima was there not long ago! aaah!!! Sigh... I could gush about Noah Shaw all day! I blush just thinking about him. He is my number 1 book hottie. Swoon! I love this book so much as well. I am dying for book two. Thanks for the amazing review Evie! I can't wait to read this book. There is so much hype and everyone seems to love it! People all seem to have such strong reactions to this book - they either absolutely love it or they hate it. I am so curious about it, I'll have to pick up a copy to see what the deal is! I wanted this book before your review, now I want it even more. Loved the quotes for the book. I absolutely love the cover of this book, one of my favs of the year. Thanks for the great review. I loved the whole premise of this novel and couldn't put it down once I started! Thank you for sharing your wonderful review! I first heard of this book a while ago and I just love every moment of it even though I don't know how to explain it to people. Thanks for the great review! Gotta love a boy who still loves to draw with crayons! Loving the cover...will definitely check this one out! I loved this book - Mara is so "dark", nothing like usual YA characters. I apparently have been in a bunker lol. I just picked this book up fromt he library the otehr day to read because I started finding reviews about how amazing this book is. I found one that said otherwise, so I figured it was worth a shot. I'm excited to read it. the cover drew me in first and then all the reviews I found sealed the deal and I checked it out. 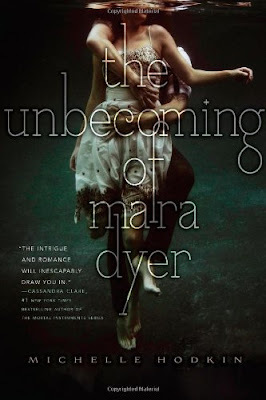 I loved The Unbecoming of Mara Dyer, too! I posted a review of it about a month back, because it took a while for my brain to create coherent thoughts, and even then I couldn't express how much I loved it! Another great book! My TBR list is piling up fast! Good thing, I heard about great things about the book so I'm not "living in an underground nuclear bunker". Thanks for the review! I definitely want to read this book now! Thank you for the helpful review.